Fly fishing in New Zealand information. For all trout fishing including fly fishing the opening day for the majority of New Zealand is October 1st. There are some areas have further restrictions ie some South Island high country areas open in the 1st weekend in November, with a very small number of areas opening on December 1st. The Fly fishing season goes through to the end of April and in some areas to the end of May. There is some limited Winter fishing, with the main and the best area at that time being the Central North Island, in the world famous Taupo area. 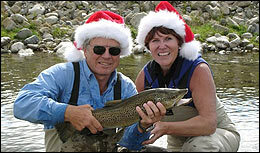 The best months for fly fishing New Zealand waters are early November through to the end of March. You should plan some other activities from about December 24th to about mid January. This is when most kiwis take their annual vacation and the rivers and lakes can get a bit crowded. It is compulsory to have a valid fishing licence when fishing in New Zealand. A single licence to fish will cover all of N.Z. except the Taupo area. I have local licences for sale. Costs are less than $22.00 per person per day. A full seasonal licence is available, annual rates apply. I recently had a client, who landed in a day, a trout of 9lbs, two of 8lbs, one of 7½lbs and two of 7lbs!! and all on a dry-fly!! Now this is the exception rather than the rule, but all of these fish were sighted and stalked, before the cast was made. Fish in the 4lb to 6lb range are not too uncommon in some of our back country streams and lakes. Due to the extreme clarity of the water some of the fishing can be technically difficult, but at other times almost ridiculously easy. Most of the time, however, the fish are sighted, then a fly chosen, the fish stalked and a careful cast made!